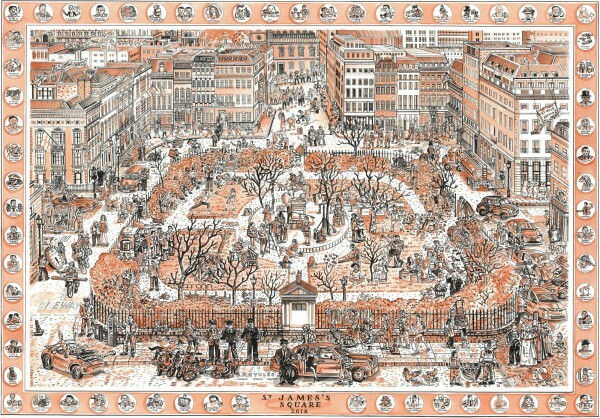 Adam Dant introduces his Map of St James’ s Sq, completed this spring just in time for inclusion in his MAPS OF LONDON & BEYOND. 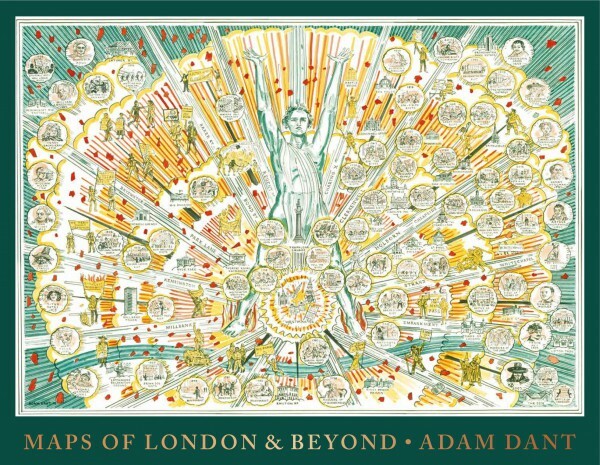 An exhibition of Adam’s maps opens at Rich Mix, Bethnal Green Rd, E1 6LA, this Thursday 4th October from 6-8pm and runs until 21st December. All are welcome. “Unlike many other public squares in London, St James’s Square is in possession of a certain aloof – an upper crust aura in keeping with the private finance offices and gentlemen’s clubs that hide behind its well attended facades. Dirty, smelly dogs are no more permitted into the gardens here than they would be in The London Library, The East India Club or the headquarters of British Petroleum – although my own dog is welcomed as a regular visitor at the nearby Christie’s auction house, possibly by dint of his diminutive size, impeccable manners and Scottish heritage. Whilst sketching from a bench in the square beneath the statue of King William III, I noticed that not very much appeared to be going on in this square. Such an atmosphere of restraint in a public arena prompts all manner of fanciful notions as to the real identities, activities and motivations of passers-by. Much in the same vein as a novel by London Library habitué Grahame Greene, visitors to St James’s square assume the mantle of the Russian spy visiting a dead letterbox, the covert couple conducting an illicit affair or the minor royal jogging incognito. The real action here has to be invented as nobody is giving anything away. Secrecy is the order of the day at The Royal Institute of International Affairs, better known as Chatham House whose famous ‘Chatham House Rules’ guarantee speakers at their events the requisite anonymity to encourage the sharing of sensitive information. Until recently, the church of Rome managed to keep their ownership of a handsome townhouse in the square under wraps, having purchased it with shady money from Mussolini. I love Adam’s illustration of St James’s Square – a veritable masterpiece! As a dog lover, this rang true of my own amazingly well behaved Boxer being lovingly accepted in unusual places, possibly because she was also bi-lingual. Her popularity at the Bank, Beauty Salon and top restaurant terraces living in Spain was due to her gentleness and the fact she had picked up and reacted by wiggling to all the Spanish vocabulary pertaining to “beauty.” On overhearing “bonita, guapa, linda, hermosa” she went into raptures. 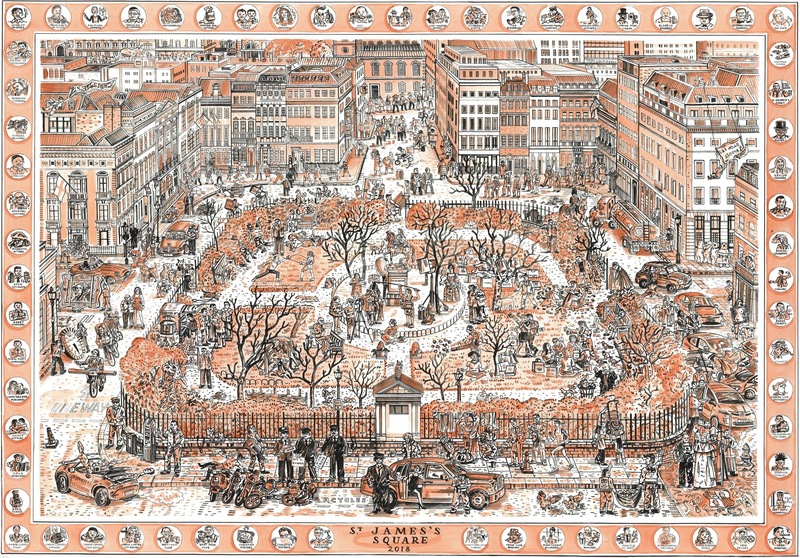 GA, I enjoyed studying Adam Dant’s fanciful and rich rendering of St. James Square. So posh, but the artist makes it so accessible. Someday I would like to venture into two particular enclaves – the London Library and Chatham House. Another great laugh from Adam. I got a great giggle out of this. I haven’t seen St. James’ Square in over 20 years, and it wasn’t nearly this entertaining when I was there! 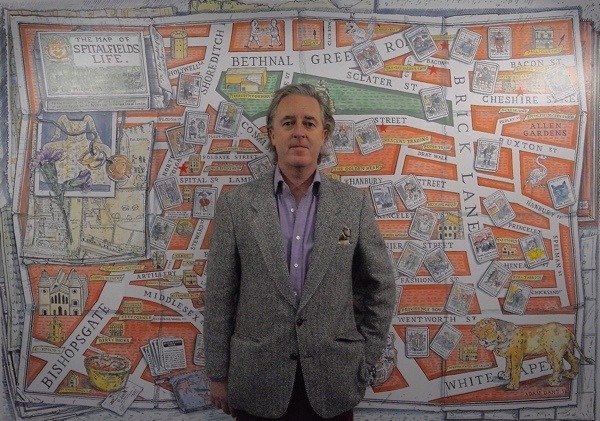 Thank you for sharing Mr. Adam Dant’s buoyant vision.